In the past I haven’t been the biggest fan of Windows 10. In fact, some of my most popular articles have been me talking about how Windows 10 invades your privacy and why you shouldn’t upgrade to it. I upgraded to Windows 10, though (part of the job scope if you’re a techie, really), and I’m sure a lot of you have over time, too. So once you’re here, you might want to know how to enhance your security and privacy even though you’re using Windows 10. I know I do. Here’s my tips. Before you go further into this guide, you’ll want to open Settings. Simply opening the Start Menu and clicking “Settings” will bring you to this screen from where you can navigate to whatever you might need. First, we’ll direct you to disabling Cortana. 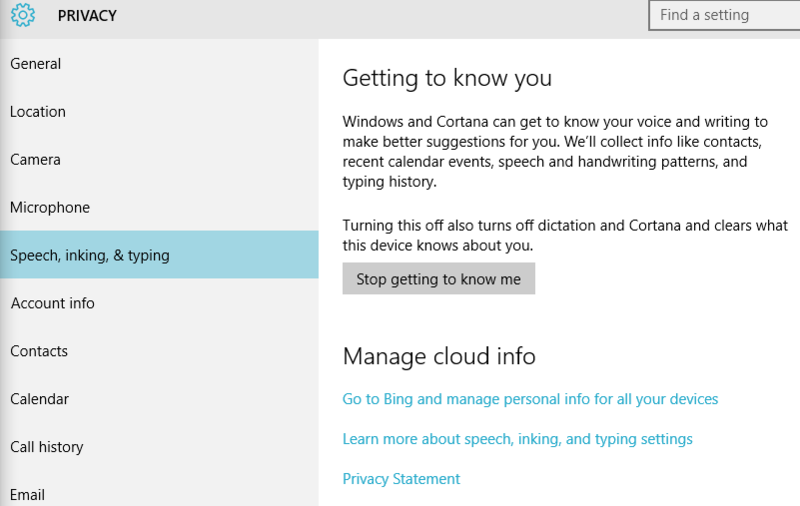 While Cortana does offer a great set of features, especially in Microsoft Edge, Cortana can also be creepy and overbearing to some people. If you want to disable it, here’s how. First, click Privacy. After you do that, select “Speech, inking & typing,” which will take you to this screen. Now that you’re here, all you need to do is click “Stop getting to know me,” and you’re pretty much set. A large part of my original criticisms of Windows 10 is the data collections. 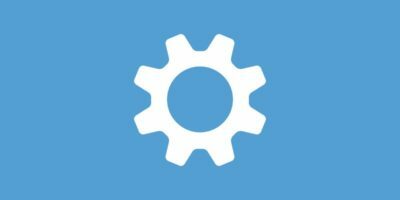 I’m still uncertain about how much of them can actually be disabled, but from what I’ve heard, this configuration should put your Windows 10 installation about even with the one you ran on 7 or 8. First, head to “General” in Privacy, and disable the options above like so. I have SmartScreen enabled, however, since there’s no real harm in it in terms of privacy. Next, change your “Send your device data to Microsoft” to Basic as seen above. 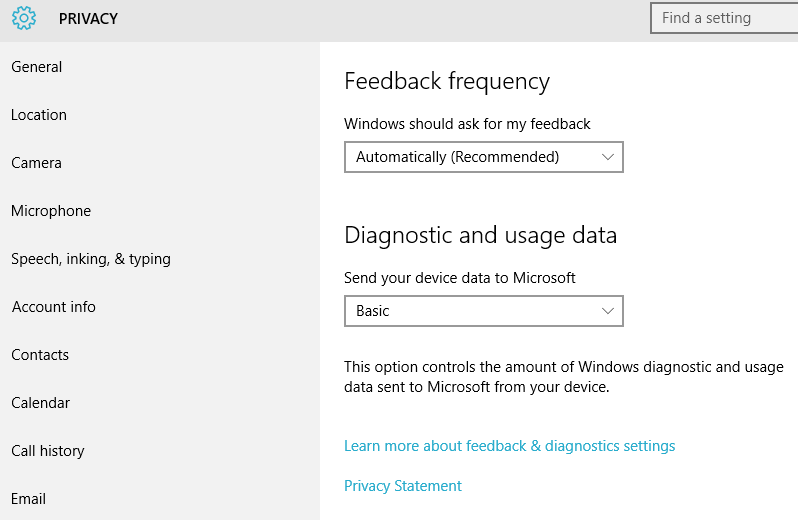 This can’t be fully disabled outside of Windows 10 Enterprise, but Basic data collection here is what you were sending to Microsoft anyways. Feedback can be set to whatever you like, too. After this, go to Start and type Control Panel. After you open Control Panel, type Customer Experience. Click “Change Customer Experience Improvement Settings.” This is a hidden program in Windows 10 that you may have enabled if you didn’t disable it during setup. If you did, it’ll look like this. Head to this webpage! This is pretty simple. 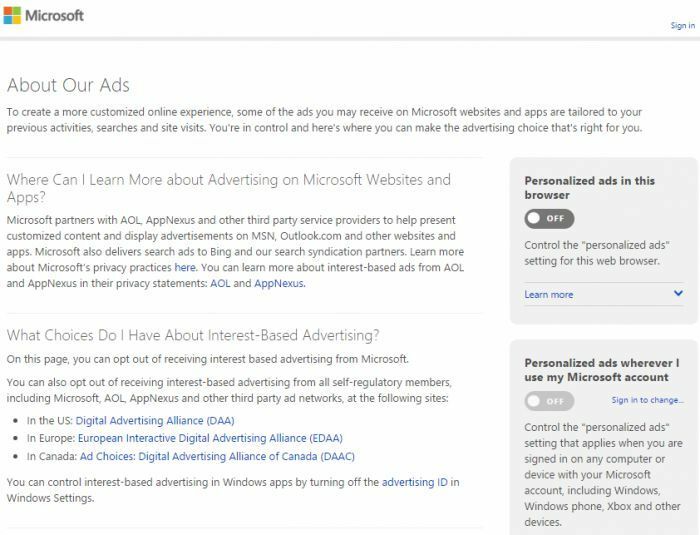 All you need to do is unselect Personalized ads on both “in this browser” and “wherever I use my Microsoft account.” This will keep MS’ targeted advertising out of your life. If you want to get rid of advertising in general, consider an adblocker. Use a Program for It! 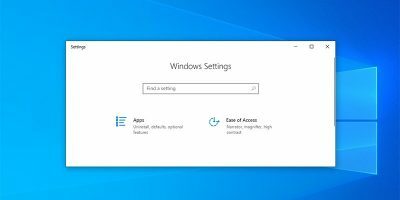 Finally, you could always use a program to disable tracking across your entire Windows 10 Installation. 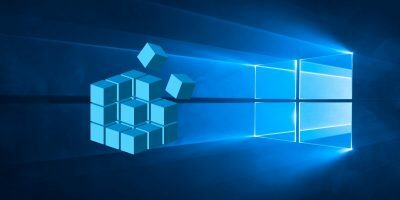 Available as an open-source project on GitHub, DisableWinTracking does exactly as it implies – it disables most, if not all, of the tracking in Windows 10. That aside, there’s not much else to talk about. 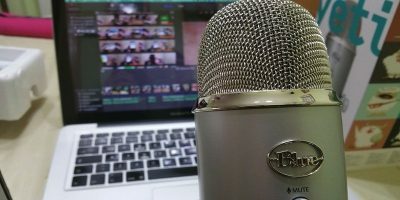 You’re welcome to disable Microphone, Location and Camera in your settings if you’d like as well, but that disables those things for the programs you use, too, which might just be a pain. Other guides may recommend disabling certain Windows Defender features, but I don’t recommend that. 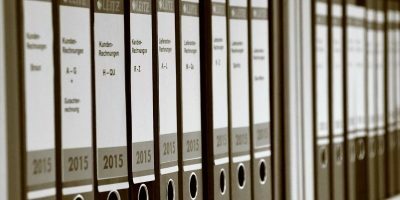 There’s a difference between ensuring your privacy and making yourself vulnerable to entities that are actually malicious. In this modern age, there’s a real reason to be concerned about privacy. 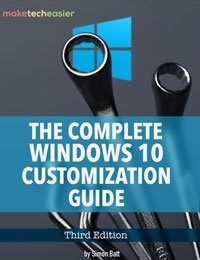 If this guide doesn’t do enough for you, you may not want to be running Windows 10 at all, but you will be sacrificing features as we move forward in technology. Hi. You are showing grayed Off buttons when you should show green On buttons, if I believe Microsoft instructions. The Microsoft webpage says to “click Off” in order to disable targeted ads. When you do so, the button turns into a green “On”, which seems to mean it’s off now! I am not sure whether I should believe you or Microsoft. Would you check it and make it clear on this great how-to of yours? Thank you for your reply. Have you another way to confirm it? I am insisting because the change “on” “off” is expected too with the other interpretation. Above all, my perplexity comes from installing Windows 10 in French. My computer screen shows the green “On” button translated as a green “activer”, meaning “enable, turn on”, meaning it’s currently off! Well, it would not be the first time Microsoft translations get wrong. The error that is causing your confusion is from the OS. It should be reading “Activé” which means “activated”, the state of being active, and not an invitation to activate. This article title is misleading. 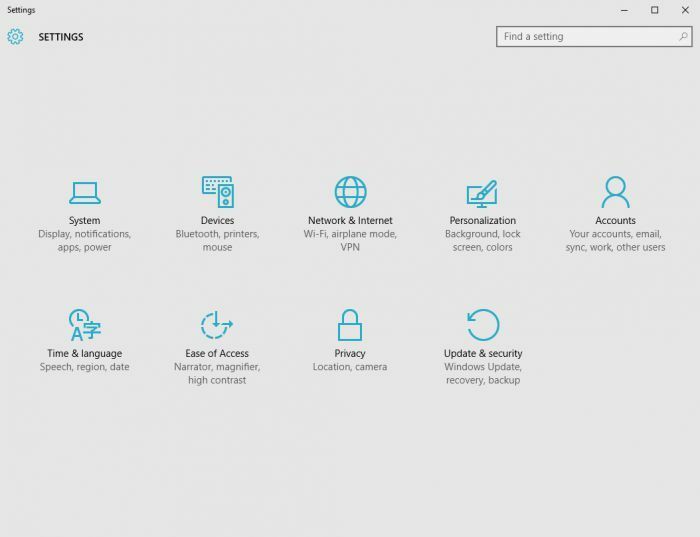 Making your Windows 10 PC more secure infers security holes. 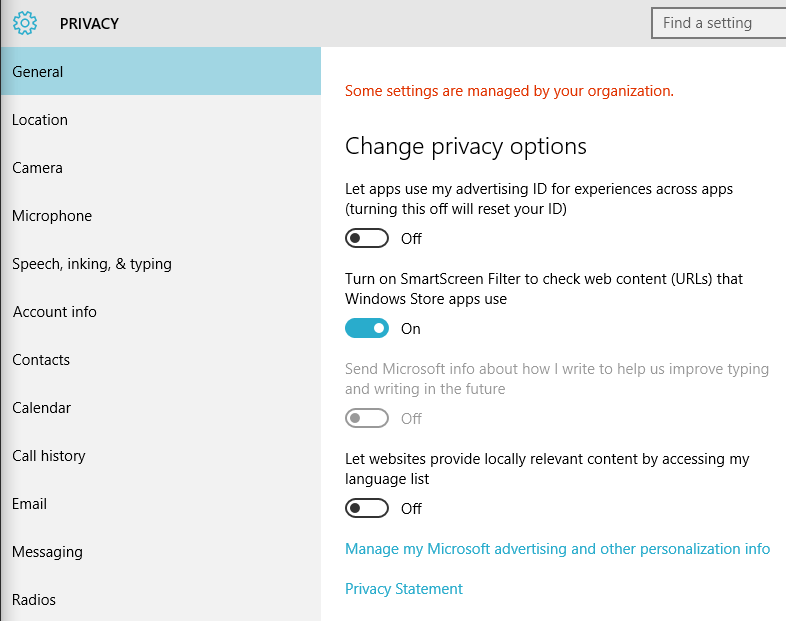 Unless you are suggesting that Cortana and the other Windows 10 features are a haven for hackers, the title should read, “How to minimize Windows 10’s data collecting to maximize your privacy.” Because we all know the same privacy issues occur across all ecosystems, not just Microsoft; can you provide links to the articles you have written to address these privacy issues for iOS, OSX, and Android? 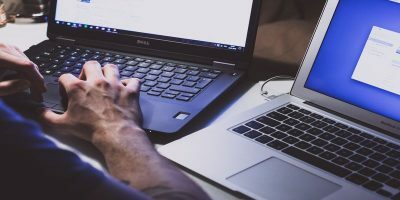 This all sounds fine, BUT the Win 10 on this machine no longer lets me pull up the start menu, instead I have to right click on the Win logo to bring up a very basic menu without access to the controls referenced in this article. PLUS if I go to the Control Panel and pull up the “customer Experience” window, it has the “I do not wish to participate …” button selected BUT it will not let me save the selection! Win 10 is morphing into a Dictator on my machine ! Linus Torvalds should be given a Nobel Peace Prize! OK, so I did manage all except ONE of these things… The “Get to Know me” button doesn’t have a “STOP Getting to know me” option. I probably managed to disable Cortana when I installed Win10 and don’t remember, which is alright… Next question is, what Anti-Virus program is best with Win10? I have Bitdefender free right now, and Uniblue ‘Powersuite’ to help with cleanup. Windows 10 phones home and it will continue to bypass any attempts to stop it . Not one single program has 100% stopped it , the only true method is to pull the physical internet which of course is a pointless exercise. 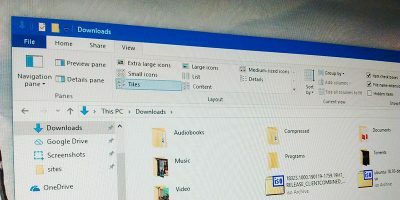 If you wish to keep privacy, put all your games on Windows and build a Linux PC from a pile of old bits for the rest of your needs (e.g P2P, E-mails , browsing , sites and in fact anything other than Windows games). “There’s no such thing as a free lunch unless a Penguin bought it ” . I’m an experienced IT techie with 20 years of experience after university graduation. My slogan is Lenny Li means troublefree IT. So from your post it sounds like your start menu has gone. Please execute the following to fix it. Your start menu should come back now if you left click the start button. If this tip helped, I welcome you email me to get connected as friend/fans etc. I found these instructions easy to follow even though some were a bit different. For instance, the Control Panel is there, without typing, with a right click on the start menu. Simple. All made sense and took longer to read than to ‘do’. Thanks.